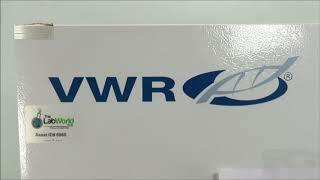 The VWR 4°C Lab Refrigerator is an ideal choice for situations needing basic refrigeration. This economical lab refrigerators provides 18 cu ft of storage, and CFC free insulation and refrigerant. The door of this upright refrigerator has heavy duty reinforced handles to stand up to repeated openings and closings, a positive magnetic door close so you know it’s shut. This laboratory refrigerator comes with 4 wire shelves and 5 door shelves to fully utilize the entire space. This VWR 4°C General Purpose Refrigerator has been fully inspected and comes with a temperature validation report. Please note that this is a brand new scratch and dent model and has a small nick on the side. All of our lab equipment comes backed with our standard warranty. Should you have any questions, please don't hesitate to contact us.